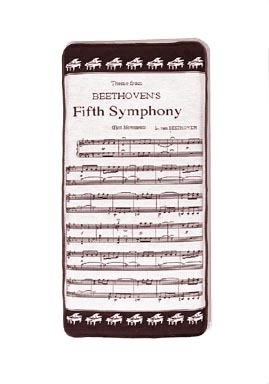 Beethoven's 5th - Tapestry Cushion is rated 4.31 out of 5 based on 35 ratings. Probably the most recognized symphony in history - 36 measures of Beethoven's 5th woven into a tapestry cushion. 1" thick, 2" thick or 3" thick for great comfort and style. Black on beige - with matching black backing, piping and ties (we make sure THIS symphony isn't moving).